The beanie and the pink boots are the cutest ever!!! Love you so much cute snow bunny!!! the beanie + scarf + boots combo is killing me 💖 too cuuuute! I can’t wait to see photos from your sister’s wedding!! Love this pink and red look, so warm cozy and fabulous! Have a wonderful long weekend! LA is going to be a blast! Looking so cute, gf! Love this fun puffer jacket! This winter is freezing so I may need it too! Love your fun hunter pink boots! So perfect for V-day! Have a great time in LA! Happy new year and how super cute are you in the puffer jacket! Love the red scarf too! 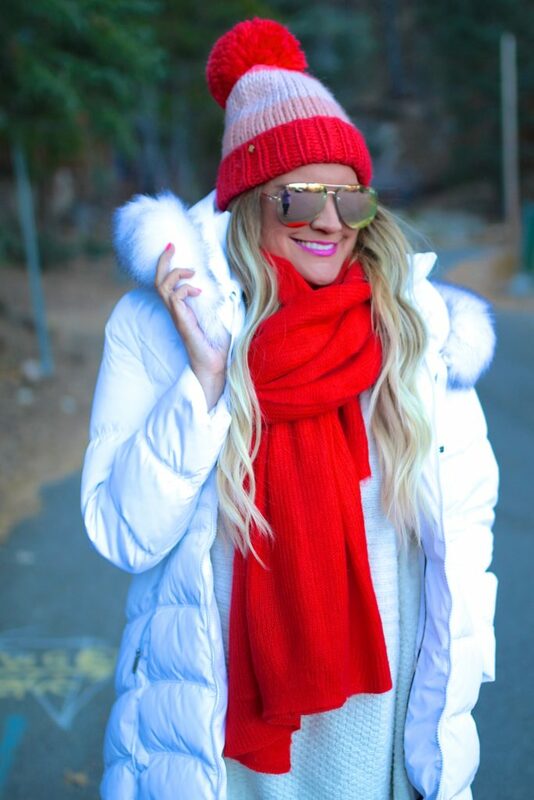 Loving the whites and your red scarf looks so amazing with this look. I can’t wait to see where this fun Valentine’s location will be! I love this soft and puffy coat and the pinks and reds you’re wearing here! Also, pink is such a fun color for Hunter boots!! 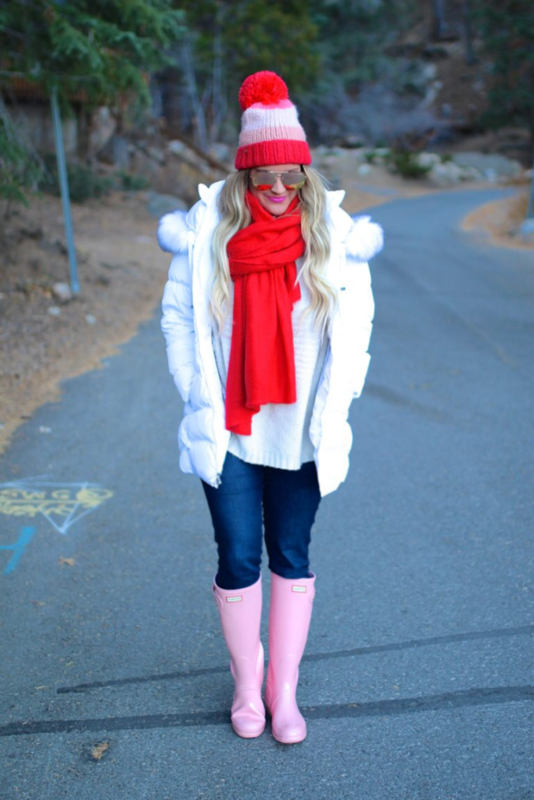 Ah I love the red and pink and white…..I mean this could be a Valentines day look if it’s super cold out! We are going to try to make a trip to the mountain with the girls depending on how much snow there is. Enjoy the long weekend! This is an adorable look for winter! I actually miss wearing my coats because it’s pretty mild here. Have a great time in L.A.–my brother lives there! This is darling! We’re already doing V-Day stuff too! Gotta get ahead! You make dressing for the cold look so cute! I ‘m loving your coat, and the mix of red and pink. Have a great weekend! Have fun in LA! That is such a cute hat. That looks really comfy. It’s cold here and I need that. I hope you had a great weekend! What a cute outfit dear. Lovely hunter booties, and that jacket is soooo fluffy and looks so cozy!